“Ice wine? – Yes, please, but only one cube.” This old joke came to me unexpectedly during a Miju editorial meeting when we tasted the Grüner Veltliner Ried Bürsting 2012 of Marion and Manfred Ebner-Ebenauer from Poysdorf. Not because of the wine – which was as dry as the joke – but because of my vis-á-vis. To identify the fruity-herbal candies from the Christmas market which were discussed was a frowning kind of work. All the more it was interesting to see which connections our mind make when nose meets wine. So we had a Grüner Veltliner from Ried Bürsting in our glasses. The EEs, how to Marion and Manfred are called for the sake of speed, enjoy working with vine-veterans. So these vines are around 50 years old and transport quite a lot expression from the heavy clay soil they are growing on. The hot location is responsible for this ripe fruit, through which some of us went so far to link their memories to indefinably candied stuff from the Christmas markets of their childhood. And yet this straw yellow powerhouse with its golden reflexes is a very complex representative of its species. Beginning with a dense, exotic fruit and a hint of minerality, yellow pear and distinct pepper, later honey notes with cool freshness, one does not expect a 08 /15 wine any more. The peppery spice called “Pfefferl”, incidentally, is not a code word of any Weinviertel vinophile-sect. You can smell it by yourself easily: put pepper in a loosely closed fist and smell by drawing it under your nose. Then do the same with a glass Veltliner. Not yet clear is whether the Pfefferl is more similar to the White or the Black pepper. Back to the Grüner Veltliner Ried Bürsting of the Ebner-Ebenauers oldie vines. Meanwhile, we have the first sip in the mouth. Its density is expressive right from the start. Extract sweetness, yellow fruit, distinct minerality on the palate and plenty of power, great embedded acidity and juicy peach in the long finish. Means: Here we have a very juicy and fruity Grüner Veltliner, which results in great harmony. The exciting thing about this wine is that it combines youthful fruit and powerful ripeness perfectly. With air, it becomes more and more harmonious. Its number of components come closer together and finally there is also a little bit of salt. What can I say about such a rare wine? Enjoy it to veggie quiche, escalope or Bäuschel, also hearty cheese is possible. The most important thing is that the food is prepared well so that it honours this great wine. Here are the analytical dates: 13.3 vol % alcohol, 3.5 g / l residual sugar and 5.5 g / l acid. Cheers! 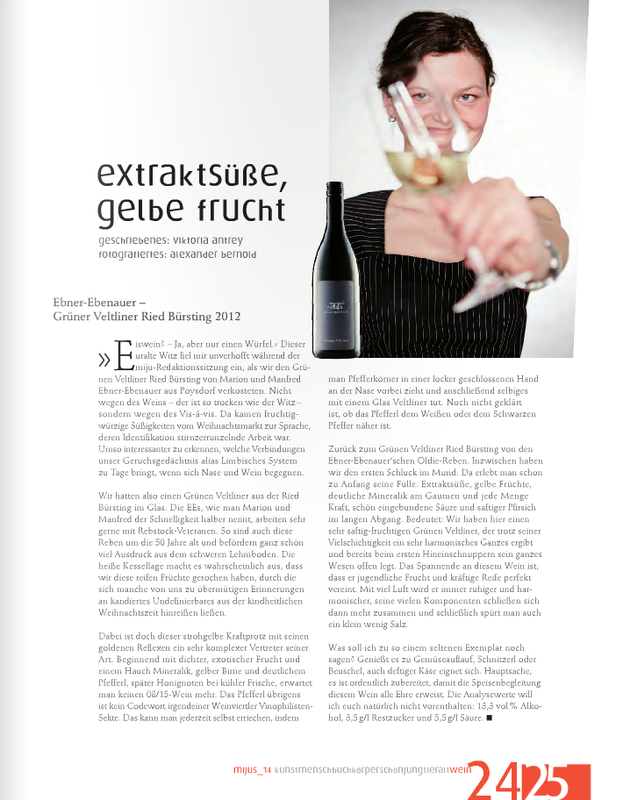 This entry was posted in Genuss, Weinregionen & Weinreisen, Winzer and tagged Austria, Ebner-Ebenauer, Genuss, Grüner Veltliner, Österreich, Poysdorf, Wein, Weinviertel, Wine by Viktoria. Bookmark the permalink.